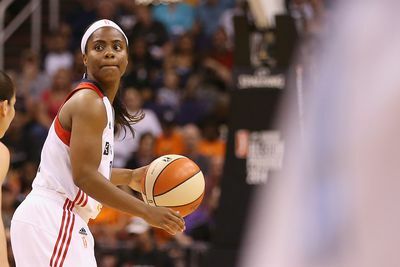 The Washington Mystics were able to defeat the Seattle Storm fairly easily, mainly because of their hot start to the game, and the play off the bench of Ivory Latta. The Seattle Storm fell to the red-hot Washington Mystics on Wednesday in the nation’s capital by a final score of 87-74. The game, which tipped off at 11:30 am EST, was played in front of a crowd of over 17,000 for the Mystics annual summer camp day. Those in attendance were quickly treated to an offensive exhibition. The Mystics jumped on the visiting Storm early as they hit 13-16 shots from the field in the first period to take a dominating 34-14 lead into the second quarter. The Storm finally found their footing in the second period, outscoring the Mystics 23-19 to cut the deficit to 16 at the half. Washington once again outplayed the Storm in the third quarter, winning the period 16-13. While in the fourth, Seattle made a valiant effort at a comeback, trimming the lead to just nine with 55 seconds to go, their heroics would be too little too late as Washington comfortably held on to secure their fourth consecutive victory. Storm head coach Jenny Boucek was less than enthusiastic in her assessment of her own team’s performance. The comments mark the first time Boucek has been openly critical of a performance from her team as a whole. The bright side for Seattle came in the form of the team high 17 points to go along with five rebounds from Abby Bishop, who managed the high-quality performance in only 20 minutes of action. Along with Bishop, the Storm also received 10 points apiece from Ramu Tokashiki, Crystal Langhorne and Markiesha Gatling. Gatling also contributed five rebounds in only 11 minutes. Jewel Loyd finished with only four points but a team-high six rebounds in 30 minutes of action. The Mystics were paced by Ivory Latta, who poured in a game-high 20 points in 25 minutes off the bench. Also putting up a stellar performance off the bench for Washington was Tayler Hill, who finished with 18 points in only 24 minutes. Combined the two shot 13-19 from the floor for the game. The standout performance for Washington tho came from Stefanie Dolson. The second-year center, fresh off her first All-Star appearance tallied 17 points to go along with a game-high nine rebounds in just 26 minutes of action. Also of note was the return of Kia Vaughn, who played in only her second game of the season and her first since June 12th. Vaughn finished with a solid eight points to go along with four rebounds and three assists in only 15 minutes.